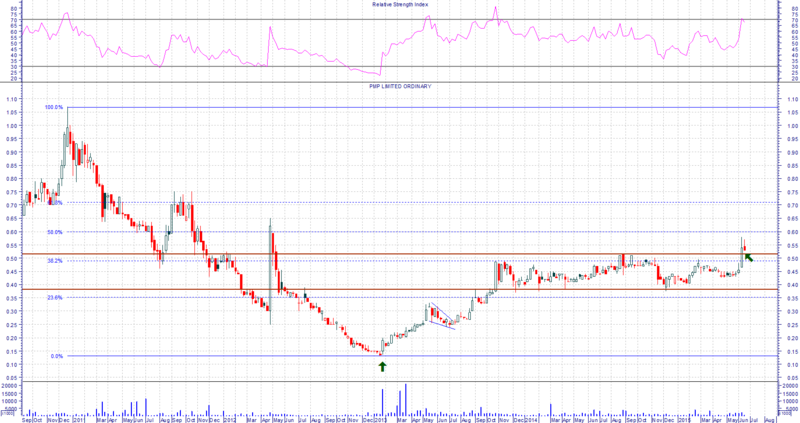 Home › Chart Review › PMP Limited continues its recovery. A company review. PMP Limited continues its recovery. A company review. From December 2010 until January 2013 the share-price of print and marketing company PMP Limited fell in a steady down-trend from a high of $1.07 to a low of only 13 cents as the future of the print media became clouded by the swing towards digital media. The turn-around in fortunes dated from the week ending 25/01/13 when the share price moved abruptly higher associated with an increase in volume of turnover.. The impulsive move higher continued in the next weeks, breaking the downwards trend line. The change in market perception followed the appointment of Peter George as CEO, whose plan was to reduce debt, and to restructure the company to embrace the opportunities presented by the digital media. Three years later much has been accomplished, and the debt balance has been reduced to $19 m from $51.7 m a year ago. It now employs 1500 workers in Australia and New Zealand and in Singapore. Its main income generator is the preparation, printing and distribution of advertising catalogues, providing it with a stable free cashflow of $34 m.
A positive consideration for shareholders is the decision to start paying dividends and/or a share buy-back, returning 50% of FY15 NPAT. $3 M of $5 M in the kitty could be paid as fully franked dividends after the annual results in August. . This is a weekly candlestick chart extending back 5 years. It shows a V-shaped rebound of the share-price, and a four-fold gain from 13 cents to 53 cents in two legs. over a 9-10 month period. Since then, in the past year and a half, the share-price has been stuck in a trading range between 38 cents and 53 cents. Two weeks ago, after the preliminary favourable report for the FY 2015, and announcement of a capital management program, the share price has broken through the resistance at 53 cents, suggesting the possibility of a further upwards re-rating of the share-price. The next target is the Fibonacci retracement half-way mark at 60 cents. This post is for information purposes only. Readers considering investing in PMP Limited should consult their stock-broker or other financial adviser for advice specific for their needs.